Poland is the country of Solidarność and Lech Wałęsa; a guy who help get rid of the Communist Party. Poland is a rich nation. Rich in history, art, culture, landscape and has gained a lot of wealth by joining the European Union. Recently, Poland replaced Hungary as the holder of the Presidency of the European Union. Poland is also a country were skateboarding is thriving. A quick search in Google is showing that there are 23 skateparks and 18 local skateboarding manufacturers in Poland. Poland has given to the world a lot of brilliant people: Mikołaj Kopernik, Fryderyk Chopin, Maria Curie, Kazimierz Pułaski, Joseph Conrad and Pope John Paul II. The last of them might be a 22 years old female skater responding to the name of Amelia Brodka. Amelia Brodka is a senior at USC; double-majoring in communication and narrative studies. She is lucky enough that the university is located between two major skateparks: Belvedere and Culver City… She also writes for the Annenberg School of Communication and Journalism’s website. And she has her own website. She is above all an amazing skateboarder. She is dedicated to skateboarding to the core. If you wonder why she is most of the times seen skating with a cast; that’s just because she is so rad that she breaks her bones and go for it nonetheless and thereafter. Really. To name just a few, Lizzie Armanto, Abby Zsarnay, Carabeth Burnside, Mimi Knoop, Jen O’Brien, Allysha Bergado, Julie Kinstrand, Nora Vasconcellos, Jordan Abraham, AmeeJay Papelera and Amelia Brodka are now recognized as the best female bowl skaters. They are actually way better than most guys I know and people start to recognize them and invite them to private sesh. 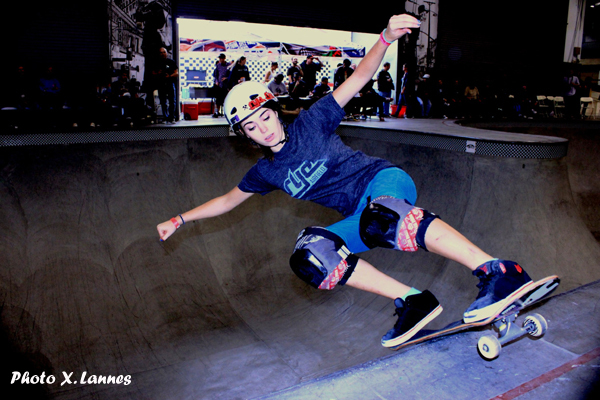 Five years from now, Amelia Brodka might well be the marketing director of a major skateboarding company, managing the image of the company, its websites, social networks, video releases, PR, team and general image. Unless she creates her own skateboarding (marketing) company, of course…. In Underexposed, the documentary that she is working on right now, one of the questions she is asking is : “How can we generate more opportunities for women in skateboarding?” Actually, Since skateboarding is DIY by essence doing it outside of the majors might be the only answer. That would not be the first time that a big chunk of skaters says F.U. to the major players. 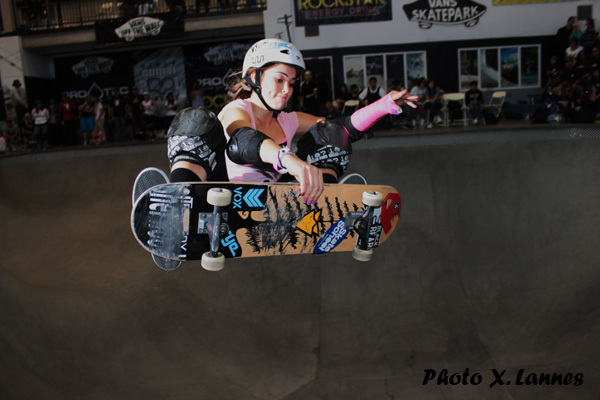 Amelia really got into skateboarding in 2002, after seeing the women's vert demo at the X-Games in Philadelphia. isTia.Tv: Were you born in New Jersey or Poland? Amelia Brodka : I was born in Poland. My family and I moved in New Jersey when I was 7. Then, I lived in New Jersey for a few years and then, I went to High school in Maine Gould Academy and then I came out to college (USC) in L.A.
isTia.Tv: You moved to L.A. just for college, not for skateboarding? Amelia Brodka:I moved because I was accepted at USC and I had a pretty good scholarship to go there, so I’ve been going there for the past couple of years. I’m doing a double major in communication and Narrative Studies and I also work on campus. I am the writer for Annenberg school of Communication and Journalism. isTia.Tv: What’s the idea behind the communication diploma? Amelia Brodka:I’m in communication because it’s broad and practical at the same time. It’s really multidisciplinary there’s anthropology to it there’s businesses to it, there’s journalism to it and it’s just a lot of different fields combined to make a really practical major and I like it a lot. isTia.Tv: Is the idea behind that that you want to work as a journalist in the skateboard business? Amelia Brodka:I want to work in the communication field but that’s pretty broad. I’d like to continue to write and I’d like to be a journalist but that’s kind of a dying art at the moment so I’d would not mind going into the marketing or PR business. isTia.Tv: Under what circumstances did you start skateboarding? Amelia Brodka: I got introduced to skateboarding when my brother had a skateboard but that was really brief, it broke and I never saw one again. And then the X-games came to Philadelphia; it was 2001 and my family and I went on a day trip to Philadelphia to the X Games. My friends and I were wandering around and then we stopped and we looked at the vert ramp and there were girls skating it and we were amazed. We want to do that! we want to try doing that .We saw Lyn-Z Adams skating and she was just 12 years old at the time and my friend and I were 12 too so we thought, we wanna do that too. So she and I just started skating after that because it inspired us to skate. isTia.Tv: So, there were a lot of skate park or vert ramp on the east coast? Amelia Brodka:No, there were no skateparks when I started skating in New Jersey. I just started doing street for the first 2 years in my skate life. I just skated a curb and one of those manual covers. We were just grinding the curb for 2 years and then this park called Rex Plex opened up but it closed very quickly so I skated there a little bit. I was skating mini ramps and then another park called Sayreville opened up in New Jersey. And then, when I moved to Maine for high school, I Started skating at Rye Airfield and that when I got into vert and bowls. isTia.Tv: And then you moved to L.A... Amelia Brodka:Yeah I moved to L.A and now I live mostly near pools and bowls so I just skate there but I try to go to San Diego to skate vert. isTia.Tv: You say you live near pools and bowls, where is that? Amelia Brodka: I just skate in Culver City or Beveldere, usually there or Vans. isTia.Tv: What did your parents think about you skateboarding? Amelia Brodka: My parents would take me to the skatepark but then I broke my ankle learning how to drop on a vert ramp and my parents told me that I was never to skate again because we did not have health insurance. I had to get surgery I think I was 14 years old. I was not crying because of my ankle was broken, I started crying because they told me that I would never skateboard again and I think that when they realized that I was not gonna stop. Every time I would get hurt, my parents would say oh, maybe you shouldn't skate but they saw that I always had my school homework done so I could go skateboarding so they did not take it away from me and eventually they were very supportive. isTia.Tv: How often do you skate now? Amelia Brodka: I don't skate every day but maybe 5 6 times a week. all my classes in the morning and go skating in the afternoon, ... It's always been something that makes me very happy so I make it a priority. isTia.Tv: Why it is that there is so few contests for girl? Amelia Brodka: I think there a few contests for girls because there aren't always as many girls that show up at contests as guys. In terms of numbers, there is not as big of a showing. You have to think about the fact that we are in a recession so companies are cutting costs where they are not getting income so .. I don't think that it's like "Ah, we don't want the girls to skate!" I think they are thinking logically like we have this much money so, what is gonna give us the most back. They have to make cuts. isTia.Tv: I see that there might be 15 girls that are at very good level, but except those 15, the level is raising fast. Amelia Brodka: Yes, that's absolutely true. Right now, the girls that get the most visibility and that are able to make it to the contests and that's mostly the girls in Southern California that people know of there is not so many girls on the same level as them, but that's because it’s growing. There is a growing participation rate and these girls are paving the way for more younger girls to be involved and in the past couple of years I have just seen a spike in number of how many younger girls I see at skateparks and the level at which they are skating is gonna grow too because they are starting younger and younger and there are more and more every day. at Vans in November 2011. Ahahaha ... Just Kidding again! So, naturally, things are gonna progress. We will see more girls skating and because of that the level is gonna grow. isTia.Tv: When you go to a skatepark, people accept you? Amelia Brodka: I definitively feel like I am accepted when I go to a skatepark, even if there is a big snake session, you know, and you can't always get a run in someone will lookout for you and kinda let you into the bowl. Everyone is really friendly and welcoming and I'm really happy that I'm part of it and I don't think there is a difference in a way that girls in street or girls in vert are treated. I think the girls in street have more contests just because there is more money in street skating and there is definitively more girls thaat skate street than girls at skate in bowls and vert, but like I said, numbers are growing but there are definitively much more things going on for girls that are street skating. That's because street skating is much more popular in general. are you actually OK? Aren’t you hurt? isTia.Tv: You are talking about injuries... How many injuries did you have? Amelia Brodka: How many injuries did I have???? it might be easier to answer it this way a lot of times when I come to the skatepark, like last time I saw Jeff Grosso and he told me are you actually OK? Aren’t you hurt? That is weird .They have not seen me not hurt. Like the first time I broke my wrist then, the second time breaking the same wrist and then I sprained my ACL and I had a lot of concussions. I sprained both of my knees, many times... So I spend a lot of my times off of my board recovering maybe more than I am actually on my board but for some reason during or after all the injuries, all I think about is getting back to skateboarding. I'm hurt and it keeps me from living a life normally but I can’t live without skateboarding. and commitment that can translate to all other aspects of your life. isTia.Tv: In Vert, no matter what, you have to wear pads, bowls, you have options, you can or you cannot and I have heard that during the Dew Tour, the guys on bowls had more points if they were not wearing pads, is that true? Amelia Brodka: Unfortunately that does make sense..
extra points for not wearing pads just because it’s gnarlier and it’s true. It’s definitively gnarlier and it looks better in a photo but I don’t think it should count against them. I don't think people should talk on Andy Mac for not wearing pads because AndyMac is awesome he can do tricks that other guys can’t do. istIa.TV: We are here at Volcom and I look at all the skaters in the pool and they are all wearing pads… Same thing at Vans, when you skate the combi you wear pads so I don’t understand why it’s more cool to not wearing pads. I understand the logic when you say they won’t take your picture if you are wearing pads, but what’s inherently wrong with pads? Amelia Brodka: There is a weird stigma about it. People criticize pads a lot If you want longevity in skateboarding if you want to skateboarding for a long time, it’s probably better if you wear pads. istIa.TV: What’s your favorite surface? Amelia Brodka: Wood! istIa.TV: How’s that? Amelia Brodka: That’s because … in New Jersey, I pretty much grew up skating wood. And then I moved to Maine I skated Rye and then my high school Gould Academy had an indoor wooden ramp so, I really got used to it what wood feels like it hurts less when you fall but people who grew up skating concrete feel more comfortable skating concrete because its grippier or because they think they gonna slip on wood So wood is what I grew up skating And I’m definitively more comfortable on it . Concrete is kinda scary . Do you prefer backyard pools or bowls? Amelia Brodka: Since I’m really bad at skating backyard pools, I prefer bowls I definitively think it really respectable to see someone that can skate a backyard pool well but I haven’t skated the backyard pools much so I like bowls better. istIa.TV: There is a different state of mind between people that skate pools and bowls? Amelia Brodka: Definitively! The guys that skate backyard pools they would probably be more line oriented and you can probably tell by the way they do their grind they probably stay in the pool more they will be more like slash grinds and they’d have better control doing lines when they will go skate something they will think about lines but people that have grow up skating bowls and mini ramps and generally easier trannies will think more about tricks and you will probably they stand up on their grinds more than open that grew up skating pools. istIa.TV: Are skateboard magazines biased against women? Amelia Brodka: You don’t really see women in skateboarding magazines and when you do see they’re not skateboarding and they’re not skateboarders there usually like barely wearing any clothes or sometimes even not wearing any clothes at all and just selling a product they are usually just a model which I don’t understand because they are a lot of really great female skaters out there that could put out really great ads. But for some reasons the industry hasn't really taken that approach. So it’s very rare to see a woman in skateboarding magazine and in skateboarding anyways. istIa.TV: Is this gonna change? Amelia Brodka: I’d like to see a change and I think just as today’s younger generation of skaters kinda grows up and become more assimilated in the skate word they’ll be more skater girls in general. So I think the magazines will realize that they target audience isn’t just your teenage boy. They’ll acknowledge that a big percentage of their audience is young girls so they’ll start including more and more girls in ads including women. 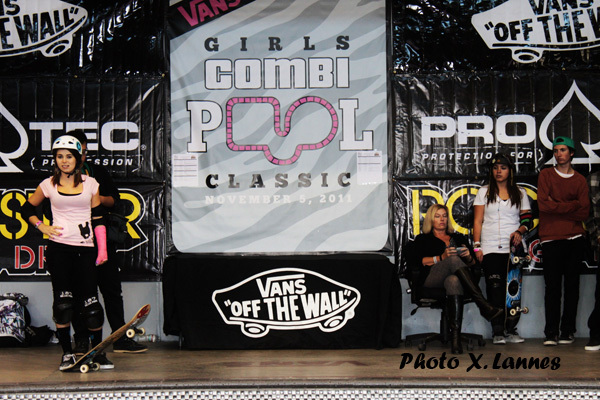 of skateboarding talent, the style, the great vibe and the willingness these ladies had to take a hard slam. " istIa.TV: So you can be feminine and skater? Amelia Brodka: Yes! You can definitively be feminine and a skateboarder. 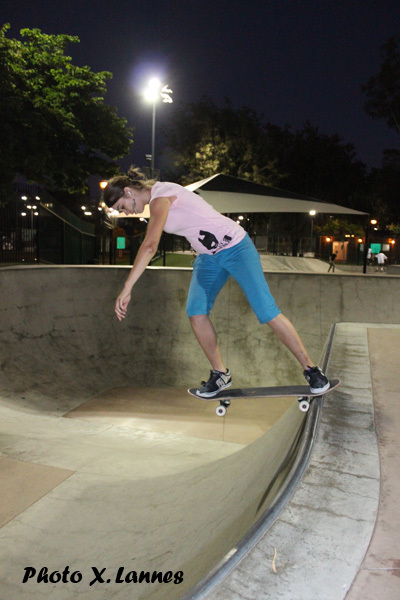 Look at Lizzie she wears the cutest shirts in most contests… There are definitively feminine skateboarders out there. There are a lot that dress more feminine than people might think. istIa.TV: What about the girls’ organizations, Gro, SLAG AGSJ. What do you think they bring to women’s skateboarding? 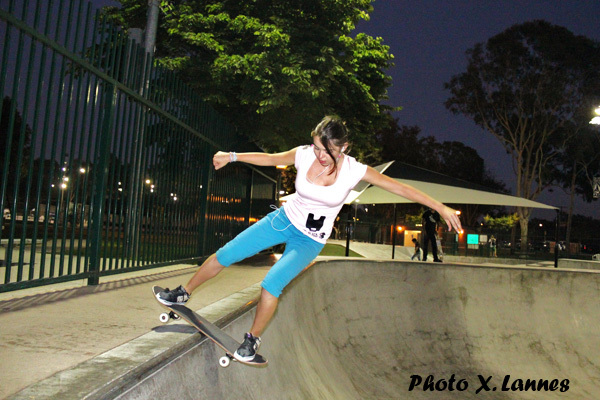 Amelia Brodka: What these organizations are doing is there kind of creating communities of girls’ skateboarders . I know GRO is doing a nationwide tour sparking communities of girl skateboarders bringing girl skateboarders together in various parts of the country and then teaching more girls to skate. That's more grass-roots oriented. 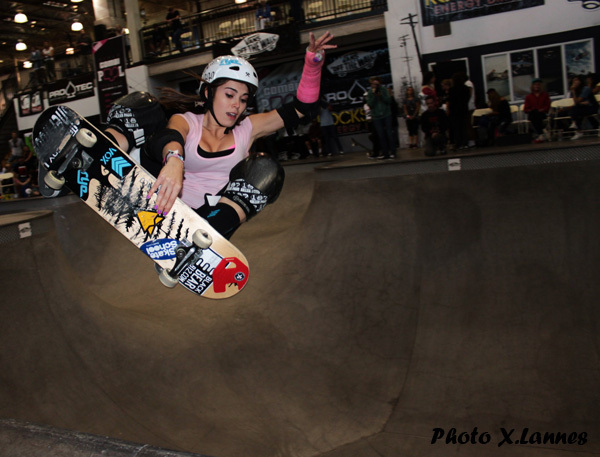 That's all about the growth of the next generation of girl's skateboarders. 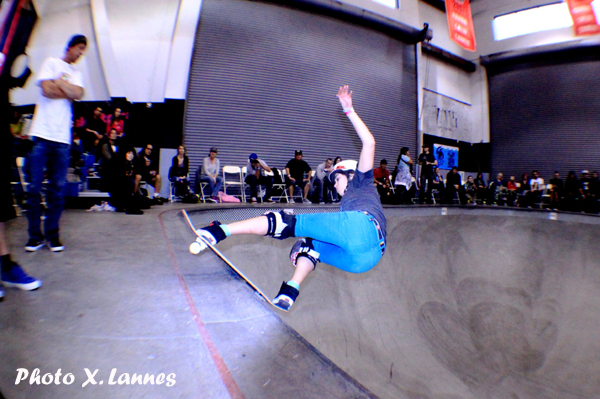 What All Girl Skate Jam has been doing is providing more exposure to women's skateboarding. They put together events that kind of put it out there. For some reasons a lot of people outside of the industry still think that they aren't a lot of girls involved in skateboarding. 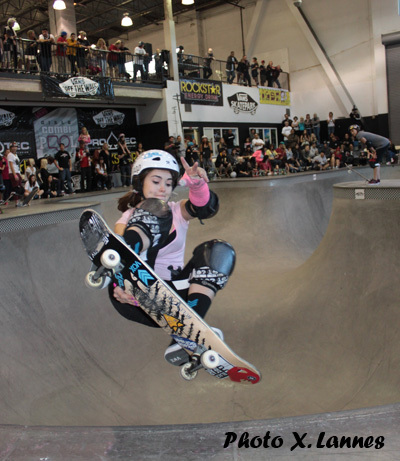 All Girl Skate Jam, by putting their contests and event to get more exposure, is just helping it grow in the media sense. And SLAG is similar to GRO in the way that it just link communities of girls who skate. I know they have one in Portland So the girls get together and they skate they have their own girls skate events . By having these big groups of girls they are encouraging more women to skate because if a girl can walk by and sees it that then they realize that she can be a part of that because this is a group. I think that if there is a way that if all these different kind of group could unify and could work together I think that would probably more powerful than just doing small divisions across the nation. istIa.TV: I'd to talk about all you projects but I would like first to know how you met with Julian Bleecker? Amelia Brodka: I met Julian Bleecker because he is working on a book that documents a year of girls' skateboarding. He sent me a message about it probably in February 2011 and I said oh yeah I'd love to be in your book. So we met in Culver City and I actually broke my wrist within the first 10mn of shooting, but I did not want to say anything like I knew I was hurt but I kept skating. I just thought " I brought him here so I wanna land something." So I think I landed 2 more tricks after that and I kinda looked at him and I said: “You know, my wrist kinda hurts!”. And he's like OK. So we sat down and we talked about the state of women's skateboarding and we talked about his project basically what Julian wants to do is he wants to expose women's skateboarding to a greater audience and kind of make people realize that there are women in skateboarding and they do it well and they should be recognized for it. He's been traveling all over the world to take these photos. He's the most dedicated human I've ever met I think. He is very passionate about this and he's been doing some great work. 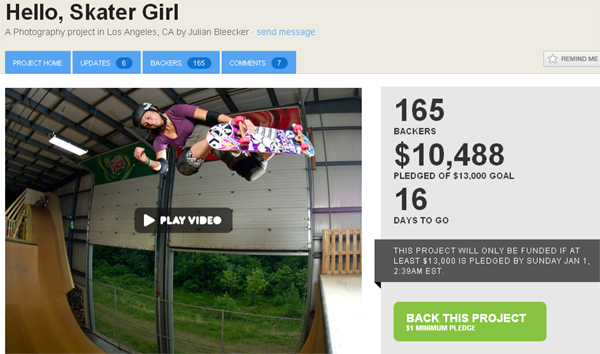 isTia.Tv: On the HelloSkaterGirl website there is a copy of the book. Is it out? Amelia Brodka: The version that you saw in his promo videos is just a prototype. It’s just a one-off copy of the book. Julian's a perfectionist so he wants to make sure that everything is done right: the way the paper feels; to the way the book pages flip. It has to be perfect! He has found different ways of printing it and he just printed a copy for himself to see if that what he wants it to be. He's got different versions of it. After a lot of tinkering, he found a great local place to print it where he was able to ensure that it would be perfect and of high quality. Then he calculated how much it would be to do a limited run and started a kickstarter page to help make it possible. There are only a few weeks left to get the money together, the way kickstarter works is if you don't reach your goal amount by the deadline, you don't get any of it. He's only a few dollars short at this point, so if a couple of more people chip in it'll be all ready to go: kickstarter.com . Amelia's Blog is beyond amazing inspiration everywhere! Keep Rocking! istIa.TV: How are you involved with Julian Bleecker's website? Amelia Brodka: No. That's Julian's website. Its kinda to see the progress of the book and make people aware of what he is working on, what he is doing and spreading the word about the book. istIa.TV: Let's talk about your website. Amelia Brodka: OK, laughs... That's a funny story because, Julian, on the way back from San Diego asked me why don't you start a blog? And we had that full conversation and I said: “People don't care! What am I going to write? Oh, yeah, I went skateboarding today…” So, who’s gonna read that? And Julian looked straight to me and he said: “ People are gonna read it!”. You should make a website. I said, “No, I don’t want to make a website !”and I was really stubborn but then he opened up his I-Phone and he just checked the domain and it was still available and I said, “Well, OK that’s great” so he said, “I just bought it now you have to make a web site!”. And later that night I made the website. Initially, no-one really read it but I updated it for fun, just for photo-ops. But then I realized that it was a really good way to communicate what was going on in girls’ skateboarding because it just seems that there are outlooks for women’s skateboarding. For example there’s The Side Project, there’s the GRO website, but in terms of writing about it a blog about it or just putting opinions and ideas out there; there was nothing like that out there so I’ve been trying to make a space for that and as soon as I found out that the same day that there was no banner for the Girl Combi contest and that there was not gonna be any women’s division in Vert at the X-Games; I wrote about that and people started reading it. That day I think I got 1,000 hits! Just that day! I was shocked and I was like “Wooa people are reading what I write” That’s kinda how it all started. istIa.TV: Your blog is different from others because it gives opinions just not news … Amelia Brodka: It’s kinda scary to put your opinion out there; It makes you very vulnerable. isTia.Tv: You have hate mail? Amelia Brodka: Laughs… No. Actually I’m surprised; I haven’t got any hate mail. Laughs… But I try to be really careful not to say anything negative. I just try to look at the positive and if there’s an issue I try to bring a potential solution but my goal is not to whine or to moaner or to complain or to make anyone mad It just to put these things out there about what is going on and kinda spread the word. Lizzie Armanto, Eliana Sosco, Jen O'Brien. istIa.TV: What is Underexposed? Amelia Brodka: Underexposed initially started as my thesis’ project at USC. I started it before I even finished my junior year but it was something I felt needed to be done so I made time for it by making it worth a few classes worth of credits in order to have room to dedicate myself to it. Essentially, it’s a documentary about women's skateboarding and the skateboarding industry so it highlights the skills of women that skateboard but it also tries to discover what the opportunities are for women and girls who are interested in skateboarding whether they want to just have fun with it or whether they want to pursue it. Skateboarding has brought so much joy to my life that I want to make sure that there are ways to open doors and welcome more girls to participating in it. A key component in doing that is visibility and the message that advertising and the media are sending out. In order for it to grow it needs to be seen, especially at a time when the level is rising and the opportunities for women seem to be dwindling. It's not an outlet for complaints or an attempt to vilify anyone, it's just a way to seek growth and opportunities while providing a media outlet to a sect of skateboarding that isn't always shown in traditional skate media. Do we just need to make our own opportunities outside of the skate industry? The skate industry budgets lies elsewhere so we need to seek solutions ourselves. It’s just a means of spreading awareness about the current state of women's skateboarding and seeing how we can help it grow. istIa.TV: Who are your partners for the project? Amelia Brodka: Brian Lynch has put a lot of work into this project as well. Initially, I just thought: “I’m just going to shoot this documentary. I have no camera. I don’t know how to use Final Cut. I don’t even have a microphone. But I’m gonna make that documentary!”. I thought, that I would use my school’s equipment. I could learn how to use Final Cut myself. I could borrow cameras from friends. I could use my I-Phone. And that’s how it all started. 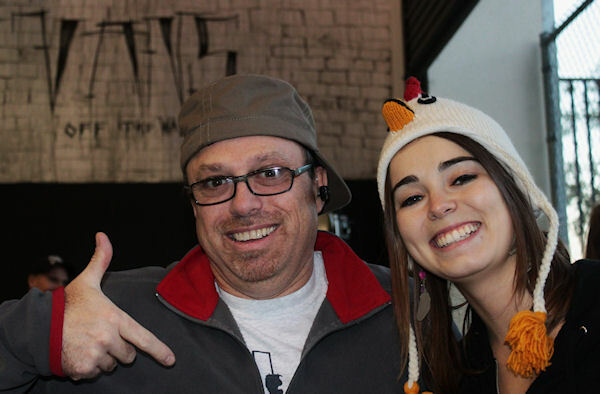 And then I met Brian Lynch who does the skatepark blog. I went to skate with him and kind of picked his brain about film equipment. And he asked me if I needed some help producing. I definitely needed help but I wasn't really in the position to pay anyone and I wasn't really sure whether he was just saying that or would maybe sometimes help. He came along for a shoot in San Diego back in June and has been absolutely dedicated ever since. If it wasn't for him I would still be trying to figure out how to mic someone. He's also done a great job covering all of the events and quickly putting out recap videos. We have been going to shoot all the time. We have been shooting interviews. Interviews with people in the industry. Interviews with people who do marketing in skateboarding. Interviews with people who do the media in skateboarding and interviews with skaters. Contests, demos, photo shoots, everything. We have so much footage! Other than that I've gotten some great archive-type footage from Lisa Whittaker, photos and video from Julian Bleecker, and my friend Sam Colen has been letting me use his camera non-stop. I have a couple of professors that’have been overlooking my progress since it is partially my thesis’ project. I have been getting some really great feedback and encouragement from a lot of people, which has been really helpful in keeping me dedicated and motivated. It really means a lot to me that people who I respect and look up to and even people who don't know me have been reaching out to me to tell me that they believe in the project. Thank you everyone!!! istIa.TV: Last words? Amelia Brodka: Thanks to everyone that has been supportive, especially when the trailer for “Underexposed” came out. I was self-conscious about it because it was my first time really doing any kind of editing, that was my first step in producing the documentary and I received a lot of really positive feedback which is just really helpful. It’s a lot of work. It’s a lot to take on and to know that I am going in the right direction, is just a lot of help. So, thank you to everyone that has been supportive. 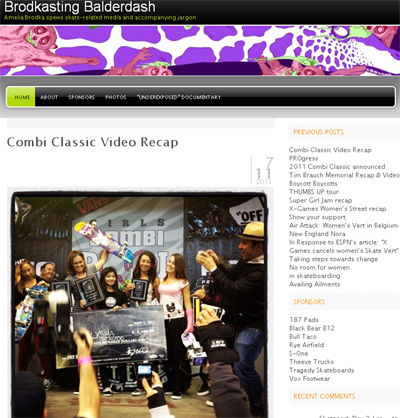 Extraordinarily talented, bright,beautiful,greatest spokesperson for girls skateboarding!